There have been growing concerns regarding the effects of human-made sound on marine mammals within the ocean over the past twenty years (Richardson et al., 1995; Hildebrand, 2005). For example, marine seismic surveys use pulses of sound to create images of the sea floor's substructure, in hopes of identifying oil and gas deposits. Seismic surveys generate extremely loud explosive sounds using airgun arrays towed behind a survey ship (Dragoset, 2003). These surveys can last for months at a time, with the airgun firing at intervals between 7 and 15 seconds. At closer ranges the sounds can be loud enough to cause hearing impairment such as temporary hearing threshold shifts (Fineran et al., 2002; Lucke et al., 2009) of marine mammals, as well as behavioral disturbances and modification (Richardson et al, 1995; Gordon et al., 2004; Di Iorio and Clark, 2010; Blackwell et al., 2013). This study focuses on longer ranges, at which these sounds produce a reverberant noise field similar to that of the rumbling of distant thunder. This rumbling can fill the time between airgun pulses, causing the overall background noise level to increase (Guerra et al. 2011), which could in turn mask biologically important acoustic signals including those used for communication, echolocation, or detection of the presence of predators or prey (Clark et al. 2009; Ellison et al. 2011). In this study, we investigated how background noise levels are increased in shallow coastal waters during a marine seismic survey. Acoustic recordings were collected by three hydrophones (underwater microphones) placed on the sea floor in Simpson Lagoon off the north coast of Alaska (Fig. 1) during a seismic survey conducted during the summer of 2012. We analyzed a total of 333 hours of recordings made between August 3 and August 16, 2012. Fig. #1: Map of the seismic survey area and the locations of the three hydrophones (stn1, stn2, and stn3). Each yellow dot represents a location where the seismic airgun was fired from the survey ship. Fig. 2 shows an example of the sound levels between seismic impulses, which we refer to as inter-pulse sound levels, in comparison with the quiet ambient noise level when no airgun was firing. In this case the inter-pulse sound levels never returned to the background noise level. Fig. 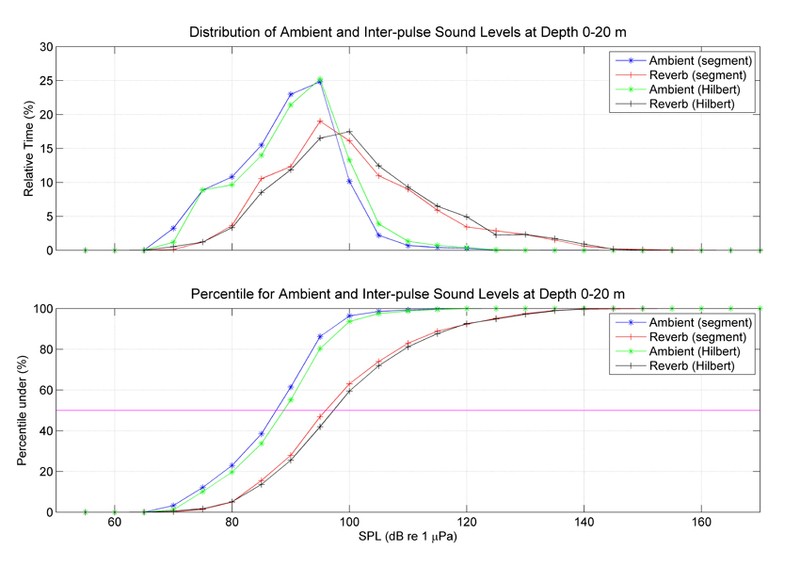 3 shows the reduction in sound level, or decay, in relation to the distance of the survey vessel. 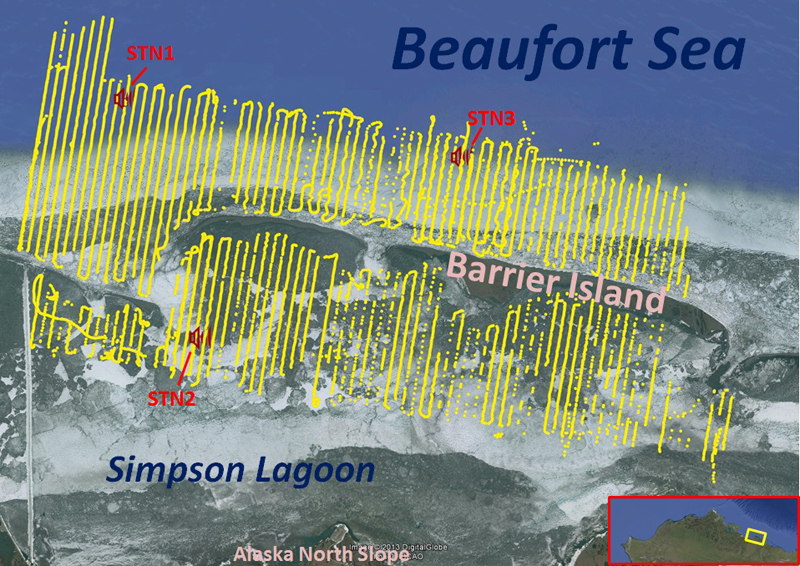 As the seismic survey ship zigzagged the Simpson Lagoon during the survey, the inter-pulse sound levels are louder when the ship is closer to the hydrophone, while the sound levels became quieter as the ship moves farther from the hydrophone. Fig. 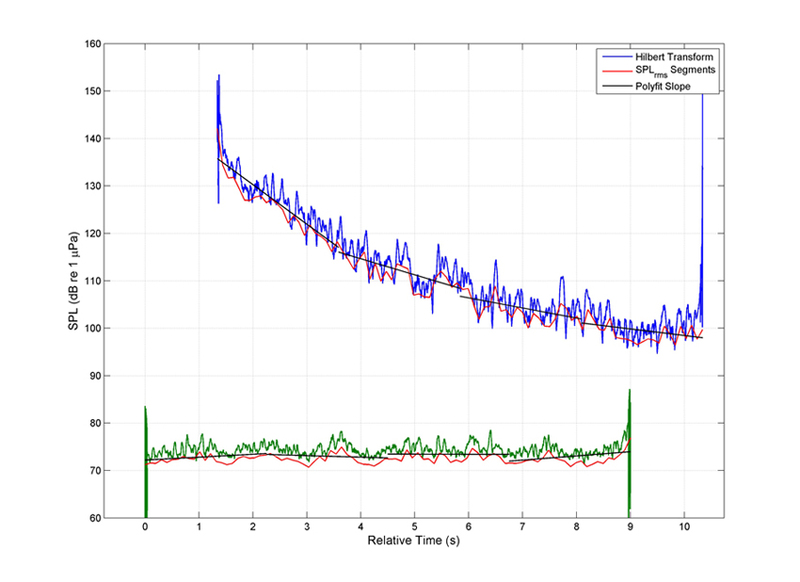 #2: An example of inter-pulse sound levels between two airgun impulses in comparison with the low ambient noise level when no airgun was firing. Fig. 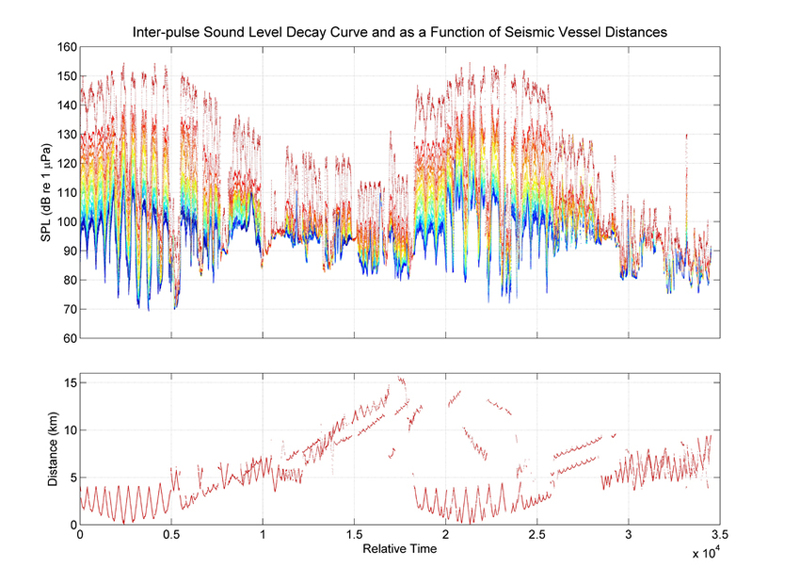 #3: Inter-pulse sound levels (upper graph) in relation to the distances to the seismic survey vessel (lower graph). In addition, we have compared the distribution of inter-pulse sound levels during the seismic survey with the overall background sound level when the airguns were off (Fig. 4). The results show that marine seismic surveys could elevate the overall background noise levels by about 5 dB in shallow waters at ranges beyond 5 km due to the "rumbling thunder effect" of reverberation and multi-path propagation. Finally, the loudness distribution during the survey has significantly higher variance than during times with just the background noise levels without the airgun firing. Fig. #4: Overall inter-pulse noise levels in comparison with background noise level when no airgun was firing. The upper graph shows the distribution of the loudness of inter-pulse noise levels and background noise level with no airgun firing. The bottom graph shows the cumulative percentage of these two levels. Blackwell, S.B., C.S. Nations, T.L. McDonald, C.R. Greene Jr., A.M. Thode, M. Guerra and A.M. Macrander. (2013). Effects of airgun sounds on bowhead whale calling rates in the Alaskan Beaufort Sea. Marine Mammal Science 29(4):E342-E365. Clark, C.W., W.T. Ellison, B.L. Southall, L. Hatch, S.M. Van Parijs, A. Frankel and D. Ponirakis. (2009). Acoustic masking in marine ecosystems: intuitions, analysis, and implication. Marine Ecology Progress Series 395:201-222. Di Iorio, L, and C.W. Clark. (2010). Exposure to seismic survey alters blue whale acoustic communication. Biology Letters 6(3):334-335. Dragoset, W. (2003). Introduction to air guns and air-gun arrays. Geophysical Leading Edge Exploration 19:892-897. Ellison, W.T., B.L. Southall, C.W. Clark and A.S. Frankel. (2011). A new context-based approach to assess marine mammal behavioral responses to anthropogenic sounds. Conservation Biology. 26(1):21-28. Finneran, J.J., C.E. Schlundt, R. Dear, D.A. Carder and S. H. Ridgway. (2002). Temporary shift in masked hearing thresholds (MTTS) in odontocetes after exposure to single underwater impulses from a seismic watergun. Journal of the Acoustical Society of America 111:2929-2940. Gordon, J., D. Gillespie, J. Potter, A. Frantzis, M.P. Simmonds, R. Swift and D. Thompson. (2004). A review of the effects of seismic surveys on marine mammals. Marine Technology Society Journal 37(4):16-34. Guerra, M., A.M. Thode, S.B. Blackwell and M. Macrander. (2011). Quantifying seismic survey reverberation off the Alaskan North Slope. Journal of the Acoustical Society of America 130(5):3046-3058. Hildebrand, J. (2005). Impacts of anthropogenic sound. In: J.E. Reynolds III. et al. (eds.). p.101-123. Marine Mammal Research: Conservation beyond Crisis. The Johns Hopkins University Press, Baltimore, MD. Lucke, K., U. Siebert, P.A. Lepper and M.A. Blanchet. (2009). Temporary shift in masked hearing thresholds in a harbor porpoise (Phocoena phocoena) after exposure to seismic airgun stimuli. Journal of the Acoustical Society of America 125(6):4060-4070. Richardson, W.J., C.R. Greene Jr., C.I. Malme and D.H. Thomson. (1995). Marine Mammal and Noise. Academic Press, San Diego, CA.